Emerald Coast MudRun Combine the excitement of running a race, the challenge of crawling, climbing, swinging, lifting, toting, sliding, and scaling obstacles, with the fun of playing in the mud; throw in a costume contest, a family fun festival with kids activities, live music, food, and everything Florida's Emerald Coast has to offer. It is an event you won't want to miss. In 2013, almost 3,700 MUDRUNNERS participated in our event. We expect 6,000 in 2014! No reviews yet for Niceville Florida Emerald Coast MudRun 2019. Click here to be the first! 10K Elite Warrior: Test yourself. We understand that a 5K just simply isn’t enough for you. We all have a competitive side. Here is your chance to show it off. This race is timed (New this year… we are using a new timing company that has timed Spartan races) and we have placement prizes. Also, new this year is age categories for placement prizes. Now you can’t let your age be an excuse not to compete. Go ahead challenge yourself and challenge a friend. 5K Competitor: Want to get an official time and compete at the 5K level. This race is for you. Here is your chance to show off. This race is timed, so you get an official time with bragging rights to go with it. Go ahead challenge yourself and challenge a friend. 5K Fun Run: Make this race as hard as you want. We don’t time this race but that doesn’t mean you can’t challenge yourself. This race is self-paced and a lot of fun with friends. You don’t have to be a fitness guru to enjoy this race. We offer several time slots. You pick the one that works for you and your friends. 1- Mile Kids Fun Run: Your kids will love this. The course is about a mile long and is perfect for 5-12 yr olds. The very first obstacle they hit is a giant water slide (So fun…). One parent may run along for free with your child/ren in this mud-filled 1-mile adventure. Zero Dark Dirty: This race is exactly like our 5K Fun Run with the added twist of running at night. This race is a blast. Sun goes down, music goes up, glow sticks are glowing and the atmosphere is a party. It’s ZERO DARK DIRTY, you and your friends will have a blast. This race is limited to the first 1,000 registrations. You snooze you loose on this race. Need more incentive? Save big if you register before Feb 1st. A family fun festival, live music, and everything Florida's Emerald Coast has to offer and it's an event you won't want to miss. 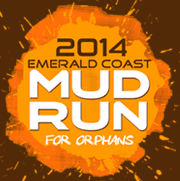 The Emerald Coast MudRun for Orphans combines the excitement of running a race, the challenge of 18+ fun obstacles, with the fun of playing in the mud; add in a family fun festival, live Music, and everything Florida’s Emerald Coast has to offer and It’s an event you won’t want to miss. Get pumped and Get Muddy to Do Good. 100% of the proceeds go to support orphans around the world through Heart of the Bride Ministries. Please see our obstacle course race discount & promotion page for all the latest discounts, promos, promotions, discount codes, and coupon codes for Niceville Florida Emerald Coast MudRun 2019. There also may be one listed at the top of this page.